Listen to Katrina Chester & Ben Neives playing "Me and Bobby Magee" on KLUV Dallas TX Morning show. Channel 8 "Good Morning Texas". KTRH (740 AM) Live phone interview with host Roger Hudson. KUHF 88.7 FM on The Front Row local arts program. Fox 26 television, Live interview at the theatre with Lanny Griffith. 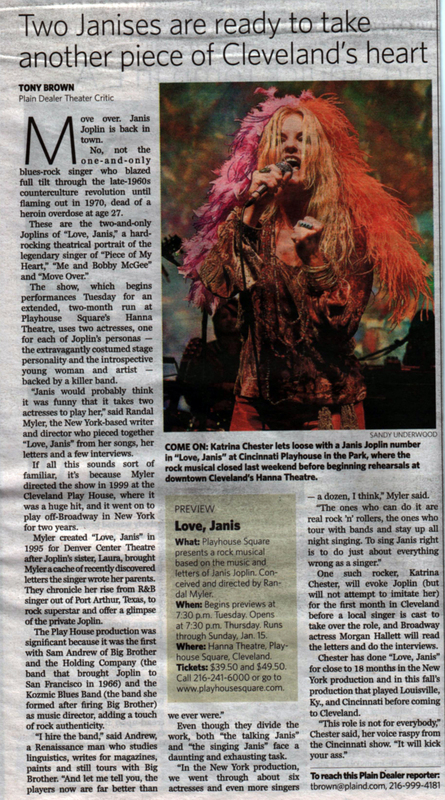 "Katrina Chester, channels Janis in a way that captures the essence of Janis and her music and completely transcends the nostalgia." Read Clifton Lemon's full review. 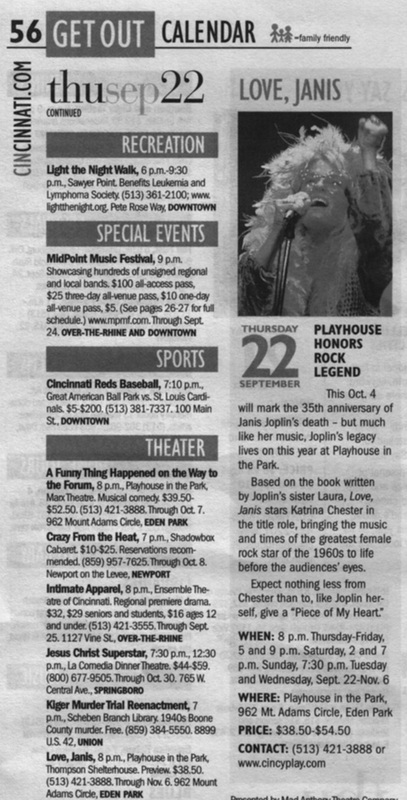 Katrina launched "Love, Janis" in Janis' home stomping grounds--SAN FRANCISCO CA ON AUG 27TH, 2007!! 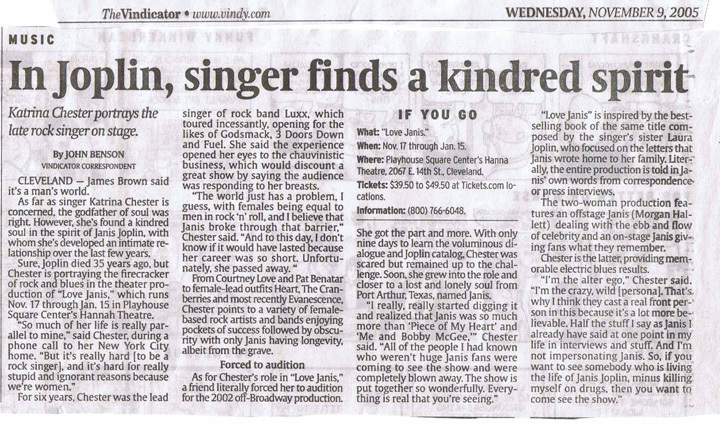 Read the article from the Courier-Journal. Charming, determined Magdalyn Donnelly in Ensemble Theatre's "A View From the Bridge" and rocking Kat Chester in the Hanna Theatre's "Love, Janis." 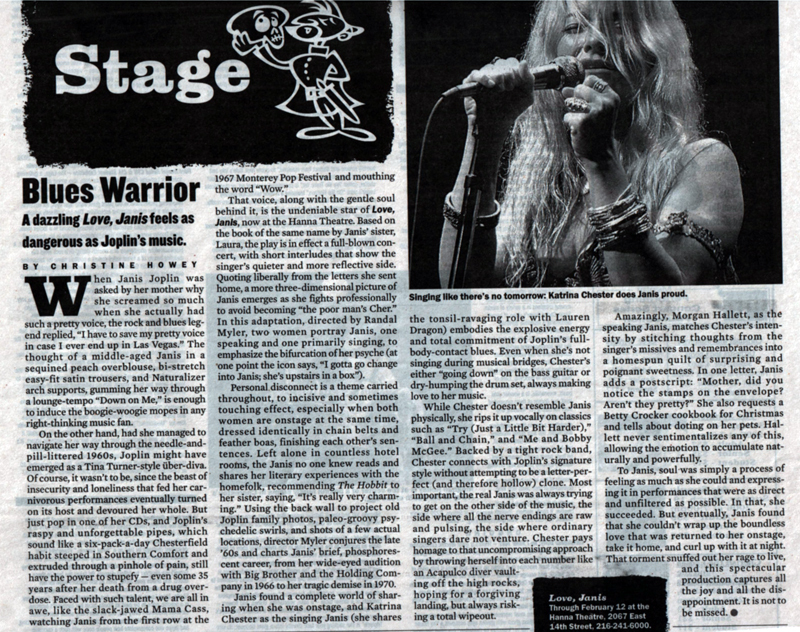 The slinky Chester, who has a band called Luxx, which has played with other bands with names such as Godsmack and Saliva (aka Smack and Spit), is the rockingest actress I've seen play the "singing Janis" role in Randal Myler's musical tribute to Janis Joplin. And I've seen five. Chester opened the Hanna production last fall, sang for a month and left. She comes back Tuesday and stays for four weeks. Here's the beauty part: She'll alternate performances with Cleveland's own Mary Bridget Davies, the bluesiest singing Janis I've seen. By splitting Joplin's persona between a "talking Janis" (who reads from Joplin's letters home) and a singing one, Myler deftly explores the little girl and the flamboyant star. 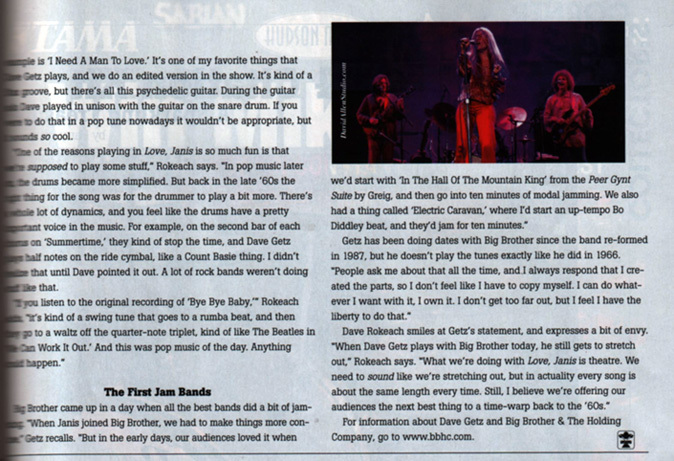 Now we can see, by going on different nights, another dichotomy that tore at Joplin: screaming rock and soulful blues. Long may both genres live (but please, rockers, hold the slobber). Continues through Sunday, Feb. 12, at the Hanna, Playhouse Square, Cleveland. $39.50-$49.50. Call 216-241-6000.
the opening curtain to the encore (and the lighter you wish you had). Symbolizing the two halves of each of us, the one we are "supposed" to be and the one our soul cries out for, Janis Joplin was split between the person her family wanted her to be and the one destiny called to her for. The blast back to the sixties takes you through the drama, fashion, and psychedelic trippin' music that epitomizes a time when the passion we craved was as important as the air we breathed. Known for her uninhibited throaty wailing, unmanageable hair and spasmodic dance, Joplin, considered one of the top three female vocalists of her time, created the legend of a woman way ahead of her time. "Love, Janis" does an essential job of helping us celebrate the life of a strong, proud, artistically entranced woman that learned how to call the shots at a very young age. Katrina Chester, an extremely talented singer in her own right, takes the Joplin tribute over the top, complete with her raspy, cutting voice. Held over for an extended engagement (by popular demand) through mid February. Don't miss this one Cleveland - It'll rock you! From Cool Cleveland correspondent T.L.Champion tl@coolcleveland.com. See Photo Gallery of Katrina Chester at shows and industry events. 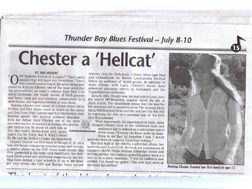 Click on a title below to view the article reviewing Katrina Chester. 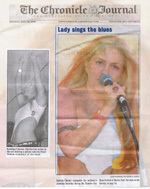 Katrina was named ARTIST OF THE MONTH for January 2008 by Rec Radio. 5 stars is not enough for this debut. Give me more Katrina. 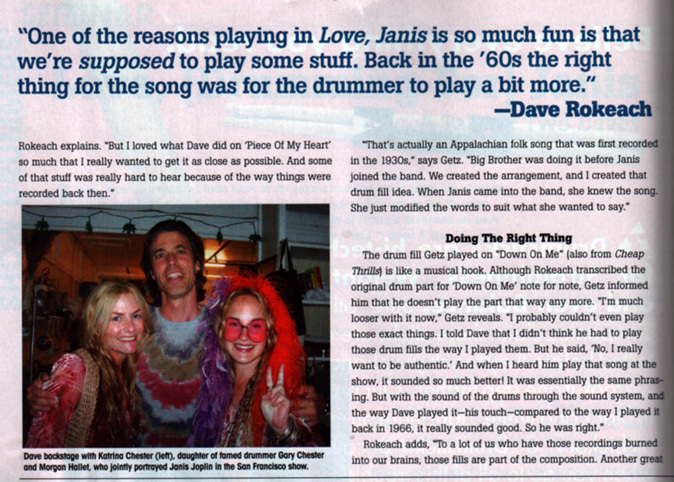 It's time to take "Love, Janis" truly national. As one who grew up with Janis and saw her perform many times around the bay area with Big Brother, I tell you that you reach back in time and capture her spirit, her voice, her essence. Of course you are much better looking than she was. If the tour doesn't go national, please go back to touring with TSO. One way or the other, I need you in my music collection. Kat rocks! The new CD is different and sweet blues. Sweet Sweet Blues..... Elaina & I Love it... Kat goes from Jagged Edge to Smooth & Sweet and doesn't miss a beat. Great mix of Soul, Blues, & Rock. I love this CD. Katrina is a multi talented singer songwriter. She totally blew me away with her passion and vocal range. Every song is filled with such power and soul. I recommend this CD to anyone who loves Soul, Blues, or Rock with a fresh sound from an emerging new artist. Gary Chester's drum book "The New Breed 1" has been re-released with a special CD. 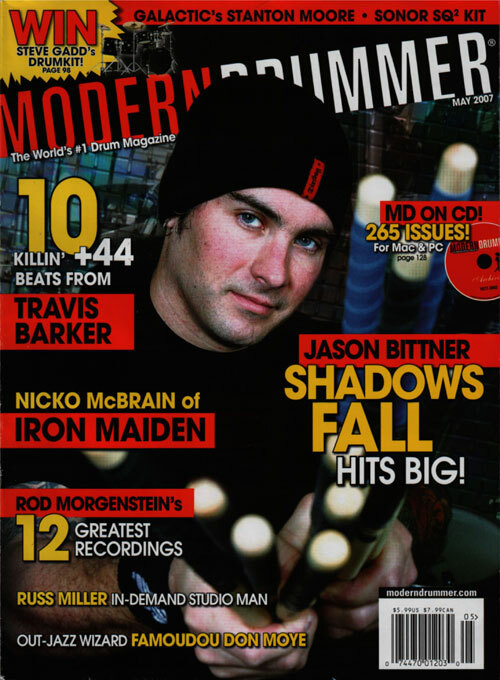 Check out the issue of Modern Drummer and visit www.gary-chester.com for more info. for a great show with Heart! Click here to see the pics!